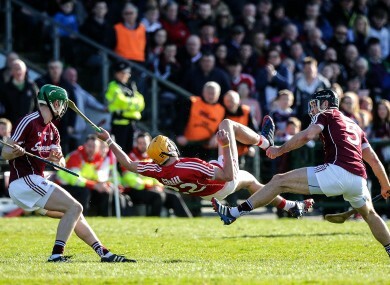 There was criticism over the hurling league last weekend. Galway's Adrian Tuohy and David Collins with John Cronin of Cork during Sunday's game in Salthill. LAST WEEKEND SAW the race for the 2016 Allianz hurling league title whittled down to four and relegation issues were also cleared up. Amidst the definitive outcomes, there was evidence that flaws still exist in the hurling league structure. That’s despite several attempts in recent times to land on the best structure for the spring time action. Every county was of course aware of the current regulations before the league commenced in February yet there has been plenty debate after the following outcomes from last weekend’s action. Cork avoided relegation despite losing all five of their round-robin games and finishing pointless. Galway only lost two of their round-robin games – the same as Dublin and Tipperary – but will now ply their trade in Division 1B in 2017. Offaly, who finished 4th in Division 1B and are effectively ranked 10th after the league, had to face the best team in the country where they suffered a 24-point hammering by Kilkenny. Limerick are now only two games away from winning the league but they will definitely operate in the second tier in 2017. And despite losing their relegation playoff against Kerry last Saturday, Laois still have another shot at survival this Saturday against Division 2A champions Westmeath. GAA President Aogán Ó Fearghail accepted yesterday that there are anomalies but believes the current system is serving hurling well. “I think whatever format you’re going to get, you’re going to have anomalies arising. You’re going to have some counties that will quite justifiably say that it’s a little bit unfair. “But when you look at it overall, the fairness of the league is that the best teams at all division levels still come to the top. “Every single system we have – we’ll always find certain issues that are probably a bit difficult. “I don’t believe that one game and one result should overall change how the League is run. “I think the current League, as it’s structured, it is set at the moment, that’s the way Central Council has determined it to be. Email “Did last weekend show up flaws in hurling league that mean GAA should change the structure?”. Feedback on “Did last weekend show up flaws in hurling league that mean GAA should change the structure?”.